A New law in Egypt which grants the president of Egypt the power to appoint the most senior officials in the Egyptian judiciary has recently been passed by parliament and it threatens the very fabric of judicial independence in Egypt. By way of a brief clarification, this blog post does not make the claim that judicial independence started in Egypt through the 2014 constitution, it merely observes that the concept is reflected in the text and former custom which exists in and around the constitution of 2014. Prior to the legislation passed on 26th of April 2017, the senior most member of the judicial institution along with the senior most members of the judiciary selected new members for the judicial branch. Through the course of this blog post, I will elaborate briefly on how I believe that the new laws which threaten judicial autonomy may in the future threaten to radicalize the Supreme Constitutional Court (SCC) in cases involving a religious claim, specifically a claim pertinent to the interpretation of Shari’a. This system provided for a check on executive overreach in the Egyptian context. The selection procedure of the judiciary draws textual authority and is reflected in Article 185 of the 2014 constitution, which states that: “All judicial bodies administer their own affairs. Each has an independent budget, whose items are all discussed by the House of Representatives. After approving each budget, it is incorporated in the state budget as a single figure, and their opinion is consulted on the draft laws governing their affairs”. To put it in simpler terms, Article 185 of the 2014 constitution determines that the judiciary is independent to administer their own affairs and that their opinion is vital to the promulgation of any law which impacts the managing of their internal affairs. Article 94 of the 2014 constitution states that: “The rule of law is the basis of governance in the state. The state is subject to the law, while the independence, immunity and impartiality of the judiciary are essential guarantees for the protection of rights and freedoms”. This article lays out the basis for governance in Egypt post 2014 as being a quasi-liberal form of governance. Judicial autonomy and independence is thus very integral to the constitutional framework of Egypt. Article 185 read with Article 94, a more general provision which expressly mentions the independence of the judiciary, gives the judiciary functional autonomy from other arms of the Egyptian government. However, the method of appointing judges was not expressly constitutionally enshrined in the 2014 constitution. The judiciary appointing its own members was largely a product of a customary constitutional norm to give effect to the provisions that I previously highlighted. Through an amendment to this procedure, the judicial councils chairman will now be appointed by the president, who selects the chair from 3 names given to him by the 7 most senior members of the judiciary’s supreme council. [i] This gives a heightened power to the president to influence the selection of the judiciary. It is important to think about why it is of the highest importance for a theocracy in the image of Egypt to have judicial independence so as to ensure the compatibility of the system with International Human Rights standards, which are applicable to theocracies in the narrow field of cases concerning religions freedom. The 2014 constitution in Egypt preserved a monopoly over the interpretation and definition of canonical texts with the SCC. This monopoly has existed since the time of Mubarak. 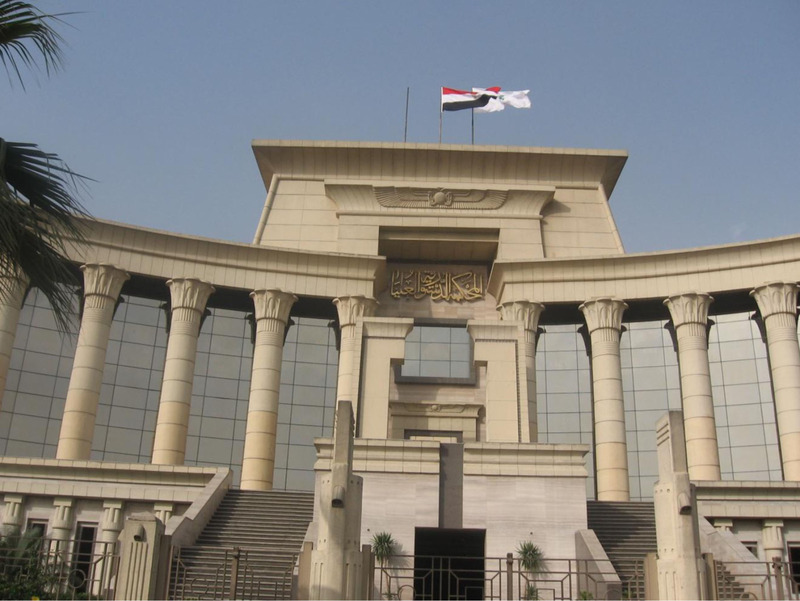 Without getting into details or specific cases, constitutional culture in Egypt has ensured that the SCC has had an interpretative veto on canonical law. Being a theocracy, standard notions of secularism and religious autonomy did not restrict the court from doctrinally reinterpreting or on a technicality interpreting the meaning of Shari’a law. However, as noted in international law, theocracies as well are bound by a spillover of secular politics and thus bound to respect universal values which are applicable not only in secular states but also to non-liberal theocracies. It would perhaps be beneficial to think of these values as safeguarding the most thin theory of the good and safeguarding rights in the most rudimentary and fundamental sense. These values are laid out in Paragraph 9 of the general comment 22 which clarifies that: “The fact that a religion is recognized as a state religion shall not result in any impairment of the enjoyment of any of the rights … including articles 18 and 27 [of the ICCPR], nor in any discrimination against adherents to other religions or non-believers” [Emphasis added]. It is further clarified in paragraph 10 that: if a set of beliefs is established as the official ideology of a constitution it under no circumstances shall “result in any impairment of the freedoms under article 18 or any other rights recognized under the Covenant nor in any discrimination against persons who do not accept the official ideology or who oppose it”. Egypt’s 2014 constitution has quite broadly functioned within the large parameters laid out in general comment 22. The primary reason it achieves this is because of the ability of liberal judges to secularize the application of Shari’a. By no means am I claiming that the constitution as a whole functions as a liberal constitution. But, through both the text as well as the SCC’s practice, Egypt seems to fulfil the bear requirements of respecting pluralism, at least on a judicial level. The 2014 constitution through the preamble continued to give the SCC an interpretive function over the principle source of law which was once again broadly stated as Shari’a. This was a change from the previous constitution of 2012 where Article 219 provided a very rigid definition of Shari’a thus limiting the courts autonomy in defining what a binding obligation is under Shari’a. The preamble of the 2014 constitution states that: “We are drafting a Constitution that affirms that the principles of Islamic Sharia are the principle source of legislation, and that the reference for interpretation thereof is the relevant texts in the collected rulings of the Supreme Constitutional Court.” This further demonstrates a movement towards a more liberal constitutional policy in Egypt. It is my opinion that the 2014 constitution gave the SCC of Egypt a space to utilize its interpretive obligations to reconcile secular policy with the textual demands of Shariá. It would not be the first time that the SCC undertook this task. As noted by Ran Hirschl in his book which analyzed constitutional theocracies, it was fairly common for the SCC to justify liberal reforms through a systematic interpretation of Shari’a. [ii] The current constitution of Egypt also allows for this and this results in a profound secularizing effect specifically because judges are able to justify facially secular policy by defining religious laws to fit into the broad rubric of facially secular policies. It is a rather convoluted way in which to achieve the end but, one which is perhaps essential given the pressures within Egypt to maintain a theocratic constitutional model. What is however, curious to note is that this entire set up hinges on the independence of the Judiciary. The ability of the SCC to churn out a series of liberal decisions the likes of which Egypt saw in the 1980’s and 1990’s, the SCC must retain its functional autonomy from the executive order. In light of recent events, we have witnessed that there has been a tangible backsliding of this autonomous sphere. By allowing the president to be so integrally involved in judicial selections, it is clear that there will be a possible scenario where a fundamentalist religious idea can be pushed into policy by appointing judicial members who ideologically concur with the policy. It is for this reason that any threat to the independence of the judiciary puts the informal secularization effect that the SCC has in peril. I would like to thank Prof. Gabor Halmai for his valuable comments on this blogpost. [i] Arab Association of Constitutional Law’s Judiciary Working Group, Egypt’s Amended Judicial Authority Laws, Int’l J. Const. L. Blog (May 24, 2017) at: http://www.iconnectblog.com/2017/05/egypts-amended-judicial-authority-laws. [ii] Ran Hirschl, Constitutional Theocracy (Harvard University Press 2010) at 51.